You may have been fascinated with the self destruct texting or sexting Apps like SnapChat and Poke for iOS and Android devices but have you ever imagined sending a note on a PC through web to your colleague or friend which will destroy after he or she reads its. Yes, Privnote.com is a website offering such service. 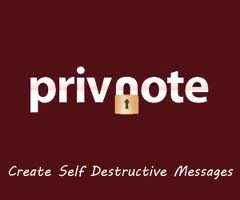 Privnote is a a private note which will self destruct when the intended reader reads it!! The easy part is you dont have to sign up or anything with Privnote, just go to the site and type out the note you want to send, enter your email id and the website which generate a code(website code). You have to copy this code into your email or in the GChat, FB Chat or any Instant Messenger and send the email/chat to the intended person. Once he or she clicks on the code, the note will open in a website and will be visible for him or her, thereafter it will self destroy. Even a soft refresh (F5) will destroy the note. The Privnote uses a secure SSL connection and HTTPS website so there is no question of any leak from the server side. Even Privnote is not a party to what you write. There are however some restrictions on the Privnote. For one, it can only be send to a single recipient. Second part is that the receiver may take a screenshot of the note and there is nothing you can do about it. Privnote also informs you via email that the note has been read. As for now Privnote is available in Chinese, English, German, Portuguese, Spanish and Turkish. So go on, give Privnote a try.